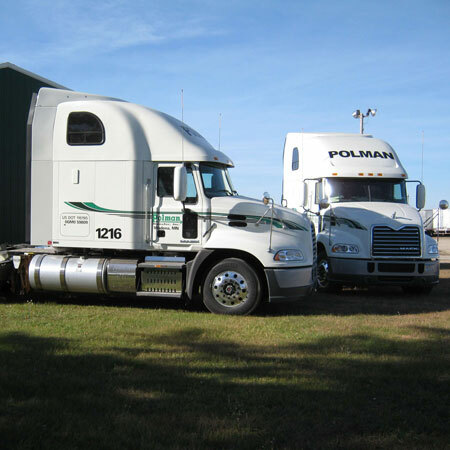 With a rich history in the trucking industry, Polman Transfer is a family-owned and operated trucking company based out of Wadena, Minnesota. Since 1946, our focus has been on providing safe, secure, on-time deliveries for our customers. Over these past 7 decades, we have developed a reputation for being the most reliable, flexible, service-oriented tucking company in the business. At Polman, we fully appreciate that we would not be here today without our skilled drivers and experienced logistics team, who are every bit as committed to your satisfaction as we are, and will do everything they can to take the stress out of shipping/receiving for you. Polman Transfer operates company-owned, and owner-operator tractors, which pull vans, reefers, flatbed and step-deck trailers, to transport general commodities throughout the lower 48 states and Canada. We’ve expanded our services to encompass a number of other trucking services as well. To appreciate Polman Transfer’s dedication to family values and excellent customer service, one must understand from whence we came. Ours is the story of a forward-thinking man who sought to provide for his growing family and to teach his children the value of a hard day’s work. It was 1946 when Duane Polman, Sr. hit the road in a Chevy truck, transporting the company’s first official load. More than 70 years later, Duane’s legacy lives on in the company that bears his name. Whether you need to hire a one-time driver to cover a load or require comprehensive freight services, Polman Transfer is ready to go to work for you. Polman Transfer is hiring company and owner-operator drivers who have a valid Class A license. We are looking for individuals who are flexible, dedicated to a team approach and are committed to providing superior customer service. In return, you’ll receive an excellent employee work environment, including competitive benefits and pay, in addition to mileage, safety and roadside inspection incentives. At Polman Transfer, we take the family approach to business very seriously, allowing time to consider each individual applicant to determine where they best fit into our company. Whatever your particular skill set or experience, we encourage you to give us a call to discuss what you are looking for, and we’ll work with you to find the best position for you. We are a company on the move! For more than 7 decades, the Polman Transfer family has worked hard to develop a reputation as the most reliable, service-oriented company in the industry. Contact our office today for more information.